More than 650 people have been killed during weeks of flash flooding and landslides triggered by heavy rains, Chinese media reports. The violent summer downpours have affected 119 million people, destroyed 450,000 homes and nearly eight million hectares of crops, Xinhua said. Seventeen people were killed across four provinces this weekend alone. 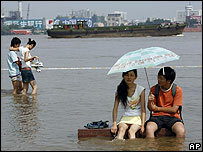 The Red Cross has launched a $7.7m appeal, calling it some of the worst flooding to hit China for a decade. "There's an urgent need for rice, clean drinking water, shelter, clothing, medical services and disinfectant," said Gu Qinghui, of the International Federation of the Red Cross and Red Crescent Societies. "It's the rural poor who are suffering the most, including many farmers." More heavy rain is forecast for the south-west, north-west and north-east parts of China in coming days, according to Xinhua. Over the weekend, fierce storms claimed the lives of 10 people in the central province of Hubei, where water levels on China's biggest river, the Yangtze, have reached some of their highest levels so far this year. Five people died in north-west Shaanxi province while one person was killed in a lightning strike in the south-west province of Sichuan, Xinhua reported. One person was also killed in eastern Anhui province, where millions of people have been affected by the swollen Huai River. Deadly flooding is an annual problem in China, with millions of people in central and southern parts of the country living on reclaimed farmland in the flood plains of rivers. Last year some 2,704 people died in flooding and typhoons in China, according to the country's Meteorological Administration. But experts are warning that global warming will fuel more intense and frequent storms.